What is the Difference between an Irritant and an Allergen? Irritants and allergens are both examples of agents that can cause sensitive skin reactions. While there are many similarities between the causes and symptoms of irritants and allergens, there is one notable difference. In this article, you’ll find an overview of sensitive skin subtype 4, as well as more information about contact dermatitis and why both irritants and allergens fall into the same category. When people say that they have “sensitive skin,” this can mean a number of different things. In order to properly treat and care for your sensitive skin, it is important to first identify which of the four sensitive skin subtypes you are dealing with. In the case of contact dermatitis, the fourth subtype, both irritants and allergens can be underlying causes. Because of this, irritation and skin allergies can present with similar symptoms, including inflammation, itching, redness, and scaling. Inflammation is the root cause of all sensitive skin reactions, including acne, rosacea, neurosensory (burning and stinging sensations), and contact dermatitis. 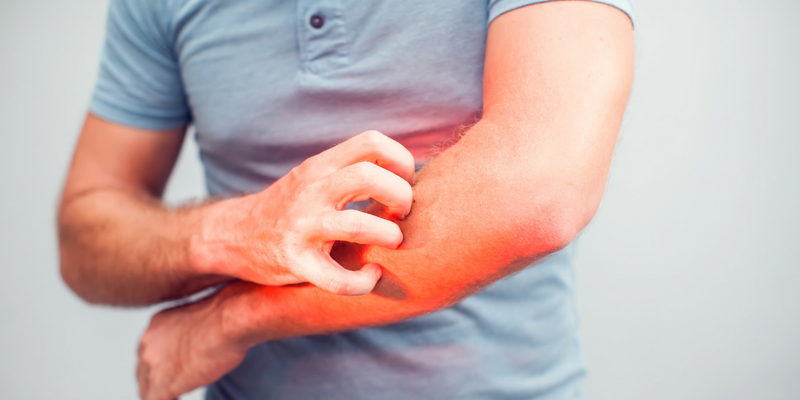 Inflammation occurs when your body’s inflammatory factors cause your blood vessels to dilate and trigger the release of a compound called histamine. This reaction is what causes the redness, swelling, and itching that you see when you have a flare-up of acne, rosacea, or rash. Once inflammatory pathways become “turned on,” they stimulate other pathways and cause a chain reaction within your body, making it difficult to turn inflammation back off. While inflammation is in its “on” stage, it can wreak havoc on your skin and lead to a number of other problems. Irritants and allergens both fall into the sensitive skin subtype of contact dermatitis. Contact dermatitis happens when either an irritant or allergen causes a rash on your skin. The main difference between the two is that an irritant would cause a skin reaction on anyone who comes into contact with it, whereas allergens only affect people who have a specific immune response to them. For example, poison ivy contains an oil called urushiol. When your skin comes into contact with urushiol, you experience a rash that causes redness, blisters, and itching. This compound is something that will bother anyone who comes into contact with it. However, not everyone will have an allergic reaction to the same allergen. Many metals used in jewelry cause allergic reactions for some people whose bodies trigger an immune response when they come into contact with their skin. If you have skin allergies, you need to keep a journal of the ingredients or substances that seem to cause a reaction. If you’re having trouble identifying the cause of your skin allergies, you can ask your dermatologist for a patch test (blood tests are insufficient) to determine the cause of your allergies. Once you have determined the cause, avoid putting those ingredients on your skin. What Are Some Common Causes of Contact Dermatitis? The first step in treating contact dermatitis is to identify the cause, if possible. As soon as you’ve come into contact with an irritant or allergen, wash your skin to try to remove as much of the substance as possible. If you are experiencing a persistent rash, see your dermatologist. He or she may prescribe you topical steroids to help reduce inflammation and soothe your symptoms. In severe cases, your doctor may prescribe you oral steroids or antihistamines. Once you have your rash under control, try to avoid coming into contact with the substance that caused it in the future. As mentioned above, it can be helpful to keep a diary of substances that cause an allergic reaction for you to help you remember what to avoid. You can also wear protective clothing when working outdoors to avoid accidentally brushing up against certain plants that are known irritants, such as poison ivy and poison sumac. Irritants and allergens both trigger an inflammatory response, which leads to redness, itching, and scaling. By avoiding substances and ingredients that are known irritants or that you know cause an allergic reaction for you, you can avoid having to deal with contact dermatitis altogether! If you are experiencing severe contact dermatitis symptoms or cannot determine the root cause yourself, seek help from an experienced board-certified dermatologist. For more skin care tips and advice, take a look at Baumann Cosmetic Dermatology’s YouTube channel, or follow us on Facebook and Instagram.